The wartime period of 6 years was to be one of the most succesful in the clubs history. Winning 25 out of 34 first team competitions primarily because they had a talented team which of course was subject to the same restrictions as every other club. Rangers played a total of 210 league fixtures throughout the period, winning 155 and losing 26. An additional 'honour' was reported on the 1st of November 1942, when it was announced that 'Rangers' had won the Championship of a Prisoner-of-War Camp in Germany. Fourteen teams had competed, all with names of English and Scottish First Division Clubs. Preston North End were second! The success of Rangers throughout World War Two has led to misinformed accusations that the club, in particular Bill Struth, deliberately placed players in reserved occupations in order that they might avoid active service. Accusations that have no basis in fact and a study of Rangers players who saw active service during World War Two is enough to dispel such a myth. One of the greatest players in Rangers history, Thornton spent his entire career with the club. He made his debut for Rangers as a 16 year old in a reserve match v Partick Thistle at Firhill in March 1936. Alongside him also making his debut was a 15 year old William Waddell. Thornton developed into a 'thoroughbred' centre forward, magnificently skilled in the air and with a deft first touch, he was a perceptive passer, stylish and sophisticated. 4 League Championships, 3 Scottish Cups and 3 League Cups, including the first treble won by any club in Scotland, he was the first post-war Rangers player to score 100 goals, and in a total of 432 games from 1936 until 1954, he scored 255 goals. Described as ' a gentleman in the fullest sense of the word', he was never once in his career ordered off, never once booked. Not just an Ibrox legend because of his deeds on the field of play, but also because of his character. His wartime service reinforces that view. At the outbreak of hostilities, Thornton signed up with The Duke of Atholl's Scottish Horse as a Trooper. Serving six war years with his regiment, which saw him go two years without pulling on the famous Blue jersey, Thornton saw service in Tripoli, Sicily and Italy, in unforgettable battles at Anzio and Monte Cassino as the Allies liberated Italy. 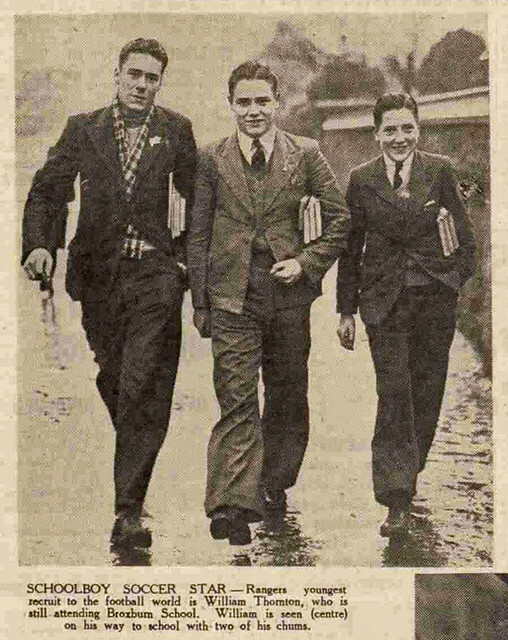 It was during the Invasion of Sicily, on 18th November 1943, where the heroics of Thornton won him the Military Medal, "for Acts of Galantry and dedication to Duty under fire" and entitled him to sign his name as William Thornton MM. The Military Medal was awarded to personnel ' For Bravery in Battle on Land.' The Scottish Horse Regiment in six years of fighting during World War Two saw only 19 Military Medals awarded. 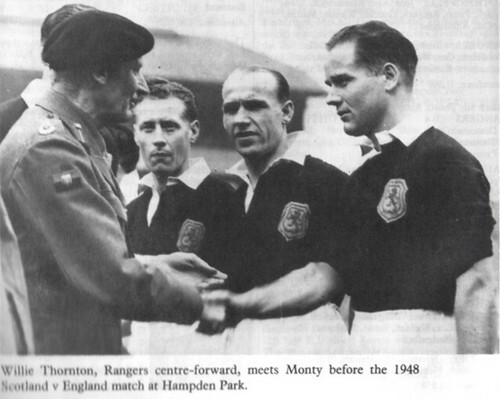 After the war ended, Thornton returned to play professional football for his beloved Rangers. 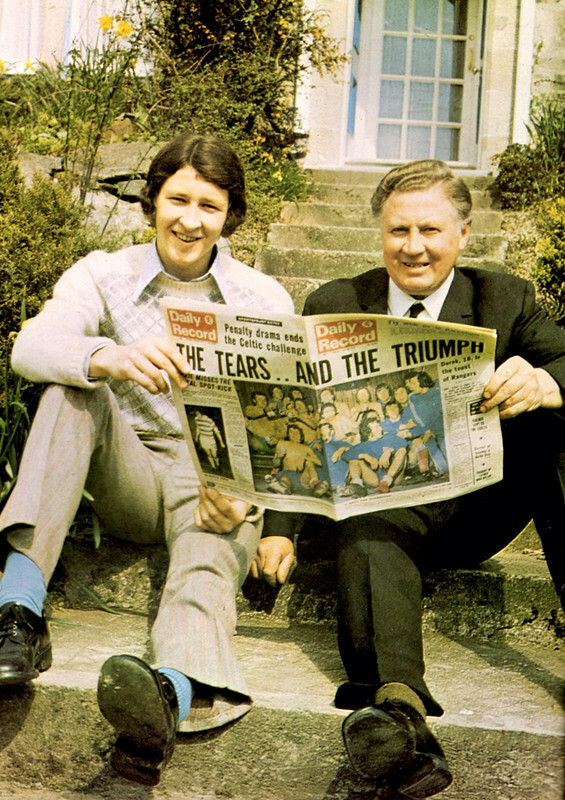 Having done his part for King and Country, his goal scoring exploits helped Rangers win trophies and gave people something to cheer about at a time when they were rebuilding shattered lives. 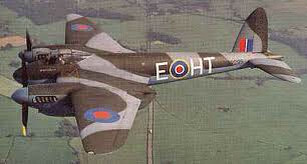 Only 563 men were awarded the Distinguished Flying Cross by the RAF. The DFC was awarded for 'an act or acts of valour, courage or devotion to duty whilst flying in active operations against the enemy.' Ian McPherson of The Rangers was one of those heroes. Born in Glasgow in 1920, he signed for Rangers in 1939. A goal scoring winger, he made his senior debut in a 3-1 victory v Arbroath at Ibrox. 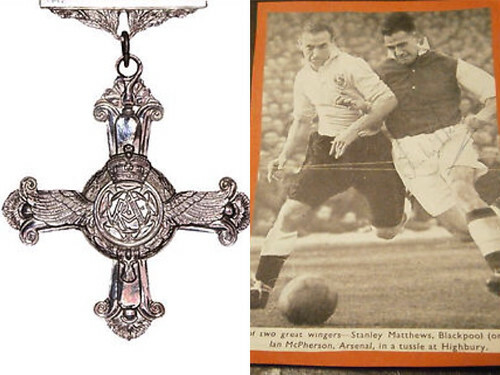 This match turned out to be the penultimate match in the Scottish Football League before the competition was suspended at the outbreak of World War Two. I suspect he knew little of what the outbreak of war would mean for him as a 19 year old professional footballer. McPherson was to play a big part in the rest of his first season, as Rangers competed for and won the Scottish Regional League Western Division. He played 11 times in the 1939/40 Season scoring 11 goals including a hat-trick v Clyde at Ibrox in a 3-1 victory. 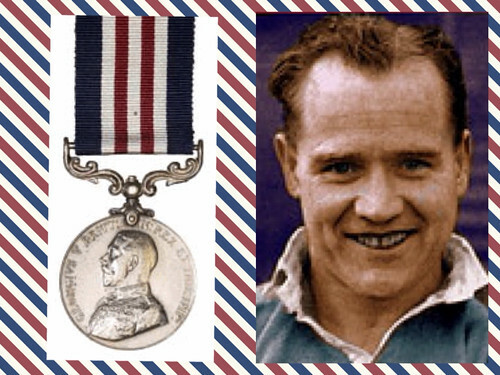 As well as the regional title, he helped Rangers to the Glasgow Merchants Charity Cup in May 1940. The next season saw him play in matches 2 and 3 of the Southern League, scoring 2 goals v Hibs in a 5-1 victory, before duty called. RAF 105 Squadron, based at Marham, was Pilot Officer Ian McPherson's new club. Flying Mosquitos, a multi-role combat aircraft with a two man crew, McPherson was to see action on the front line over Germany in this fast fighter-bomber aircraft. Assigned to fly with McPherson on the majority of his missions, his navigator tells of three occasions their aircraft was hit by German Anti-Aircraft guns and had to return to Marham on a single engine. Another time, having lost their electrics and a lot of fuel, they were not able to identify themselves coasting over the English Channel and were fired at by their own gunners who fortunately missed. The pair also had the ordeal of a crash landing after their landing gear was punctured by shrapnel. The De Havilland Dh.98 Mosquito, the aircraft which got McPherson home safely from Germany over 102 sorties. "Since the award of his Distinguished Flying Cross, Flying Officer McPherson has completed numerous sorties. Throughout all his operations he has consistently displayed exemplary courage and tenacity of purpose which, together with outstanding skill and fine leadership, are worthy of high praise"
At the cessation of hostilities, McPherson returned to professional football. Having guested for Arsenal during his time at Marham, he signed with them on a full time basis. He went on to play 163 games for the Gunners between 1946 and 1951, playing 29 games during the Championship winning 1947/48 season. The War Hero and former Ranger died in 1983, aged 62. Not so much a tale of heroism from Denmark's first ever player to play professional football outside the country and Rangers first ever Scandinavian player, but more a tale of bravado that had dire consequences. Signed in 1921 from Danish team B 1903 for £20, Hansen spent 4 years at Rangers and became a cult figure. Known as 'The Great Little Dane', he was the first foreigner to score in an Old Firm match. He helped Rangers to the 1923, 1924 and 1925 league titles before a broken leg sustained in a reserve match ended his career. He returned to his native Copenhagen, which is where this World War Two tale of woe begins. As part of the Danish Resistance, Hansen was arrested in 1943 in Copenhagen. The story goes that, after a night out with his brother, he 'harassed' a German soldier, was arrested and incarcerated firstly in Copenhagen, and then transferred to a German Concentration Camp in Neumunster for 4 months at the behest of the Nazi Occupation Forces. 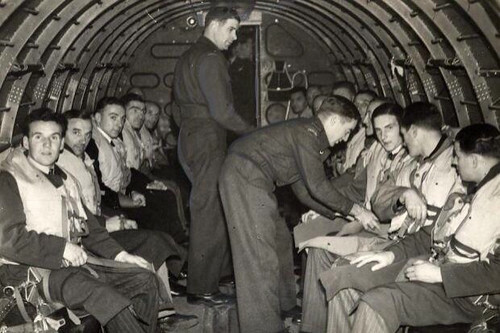 Victory in Europe Day was declared on the 8th May, 1945, and not long after that on 17 October 1945 Rangers flew to Hanover, Germany for a game against the Combined Services in order to entertain the British Army in occupation of the Rhine. Rangers lost 6-1 in front of 50,000 servicemen, Waddell scoring Rangers solitary goal. The Rangers team that day was Dawson, D Gray, J Shaw, Watkins, Woodburn, Symon, Duncanson, Ventners, Waddell, Williamson, Johnston. Unbelievably, it was a former Partick Thistle player who scored a hat trick against Rangers. Peter 'Ma Ba' McKennan signed for Partick in 1935, and found himself playing for the Combined Services that day! The Rangers team 'buckle up' for their Military Transport to Hannover! British Army - David Kinnear, Tom McKillop, James Galloway, Willie Thornton, Alistair McKillop, David Marshall, Willie Paton, Donald McLatchie (gunner in the Royal Artillery), Thomas Soutar(Captain in the Royal Scots Fusiliers), Sammy Cox(Gordon Highlanders), David Gray(served in the Middle East), Archie Macauley(Army Physical Training Corps), Dr. Adam Little(Royal Medical Corps), Joe Johnston, Willie Knox, R Cowan, P Grant, A Beattie, GDF MacKay. RAF - Chris McNee(Flight Lieutenant) Ian McPherson, Eddie Rutherford,Jimmy Simpson, Alex Stevenson. World War One also saw the Rangers contribute a great deal to the War Effort. When Britain declared War on Germany in August 1914, the 1914/15 Season was 10 days old. The Government allowed the game in the country to continue, they saw football grounds and football crowds as prime recruitment opportunities - there was no conscription until the last year of the war. International games, however, were suspended, and the SFA decided to withdraw the Scottish Cup Competition for the duration. The loss of life of those with Ibrox links extended beyond the playing staff, for the sons of directors William Craig and William R Danskin were also killed in action, whilst the son of director Walter Crichton was wounded. In addition, Rangers players Finlay Speedie, Tommy Muirhead, John Clarke, Jimmy Low, Jimmy Bovill, Willie Kivlichan, John McCulloch and James Galt were wounded in action. During the years of the Great War, a memorable event in the annals of the Rangers history took place. 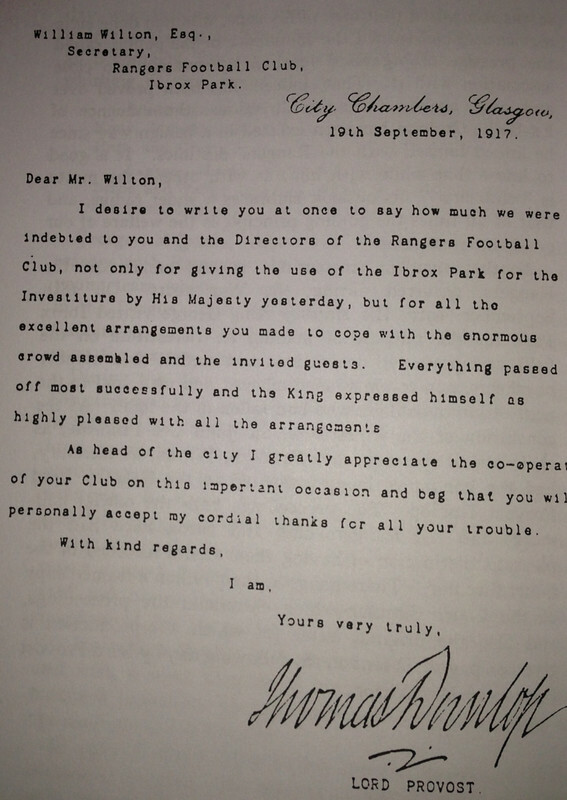 His Majesty King George V visited Ibrox Park for the purpose of holding an Investiture on the field. Decorations and Medals were presented to men and to the next-of-kin of soldiers who had fallen in the fight. At the conclusion of the Investiture, Sir John Ure Primrose and William Wilton had the honor of being presented to the King by Lord Provost Dunlop. The proceedings bore the official hallmark, and the Rangers Cub and Ibrox Park had the pleasant distinction of having their names recorded in the Court Circular. The above is not an exhaustive list of all those Rangers who have served their country during both World Wars, and indeed at any other Battles around the World. I have omitted the great Harold Davis, whose heroics during and after the Korean War are documented in his magnificent book, Tougher Than Bullets, and deserves an article of its own! Bobby Brown's War Service is covered in detail in this article I wrote earlier this year.